For people there are three necessities of life: clean air, clean water and healthy food. Numbers one and three are directly linked to plant life, and number two is very closely related to plant life. Because plants produce oxygen, clean and retain water, and plants form the basis of our entire food chain. They do this very silently and continuously, as result of which we often tend to forget that that quiet tree, or that pretty little houseplant is actually working very hard for us indeed. People simply couldn’t live without plants! Humans and animals use the oxygen (O2) in the air for their energy process and produce CO2 as waste. A plant does the exact opposite. A plant derives energy from the CO2 and produces O2 as waste. If there were no plants on the planet we wouldn’t be able to breathe. Humans in particular, however, also produce other waste. Modern life produces considerable volumes of chemical waste in all kinds of ways. Factories, cars and heating, for instance, but modern building materials and fabrics also ´breathe´ out toxins. The fact that plants also clean up these substances, because they serve as good plant food, is less well known. How do plants do that, exactly? Two parts of a plant are in ‘contact’ with its surroundings, in this respect: its leaves and its roots. The leaves have stomata. These stomata breathe in the CO2 in, and breathe out O2, evaporating clean water into the air in the process. The roots absorb water from the environment. Both the air the plants breathe in and the water contain volatile organic compounds which are unhealthy for other life forms. The roots have the ability to convert these compounds into harmless substances, providing nutrients for themselves and other soil life. The climate is changing and the main reason for this is the ever increasing amount of CO2 in the atmosphere caused by our intensive lifestyle. Not only is the world warming as a result, but plants also grow some 25% faster than, say, 100 years ago. Plants love a little CO2 and one of the potentially most successful ways of curbing the increase of CO2 in the atmosphere is consequently to make our environment significantly greener: cities, deserts, houses, walls. The fact that plants also process this waste very effectively, converting our particulate toxins to harmless, usable substances, was only discovered some 20 years ago and is not yet very widely known. People are increasingly aware of the dangers of particulate matter. Creating more green in our environment is therefore very important. Both indoors and out. Because, what even fewer people know is that, on average, our indoor climate is 5 to 10 times more polluted than the outdoor climate. Plants can also help us in this respect. Do plants deserve more respect? Plants do their work in silence. They don’t make any noise, they don’t protest against anything, and they let us process them into fabrics and materials, fuels, food and drink, That’s the way we see it, anyway. There are no campaign groups or political parties to protect plant rights. Not many people seriously consider a plant as a living thing, unless it becomes a nuisance. In actual fact, we do not appreciate that without plants, we would not survive 10 minutes on Earth. However, the ongoing processes in these quiet, calm plants are extremely complex and intelligent. 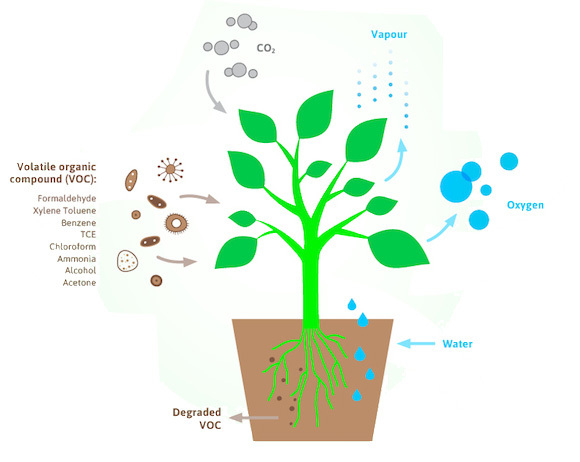 In particular, little is yet known about what the roots do, how they convert VOCs and interact with soil life. We are also discovering more and more about how plants communicate with their environment and how we could communicate with them. Research that views the subject from a system perspective is also only starting to really comprehend how important plants are for our entire ecosystem and how significant they are to all our water and climate issues. In fact, the more we learn, the more aware we become of our dependence on plants and the more we discover how little we understand about the interrelation between things. And, perhaps, the less arrogant we may become. A look at system level. In this TedX film scientist Greg Asner explains how he equipped a plane with the fantastic monitoring equipment and what this enabled him to learn about natural behaviour and ecosystems, especially in forests.